I usually get the logs by having the HoloLens connected to Visual Studio while running the app and just pulling the logs from VS. I'll see if I can reproduce that issue you are describing. It sounds like what might be happening is that you are still extended tracking the first target so when you look at another copy of the same image, you don't get a detection because that same image is already being tracked. Can you check the logs and see if you see any "tracking lost" related messages? Is there a way to see logs when running the deployed build on the hololens (I don't recall seeing a guide on getting log files)? I'm not aware of it if there is a way. Also want to do a quick update; I disabled Extended Tracking under the advanced tab of the image target. When I look at a image target it spawns the model. When I look away and then look at the same target, it spawns the model. I have than one copy of the image target printed, but the strange thing is that it doesn't seems to recognise the copies of the image target. but recognises the first one. If I cover the front camera and let the hololens do it's spatial remapping, only then it recognises the image target, but again, it doesn't recognise another copy of the target. I have been following a guide (https://library.vuforia.com/articles/Training/Developing-Vuforia-Apps-for-HoloLens) and have managed to get a deploy build on to the Hololens. 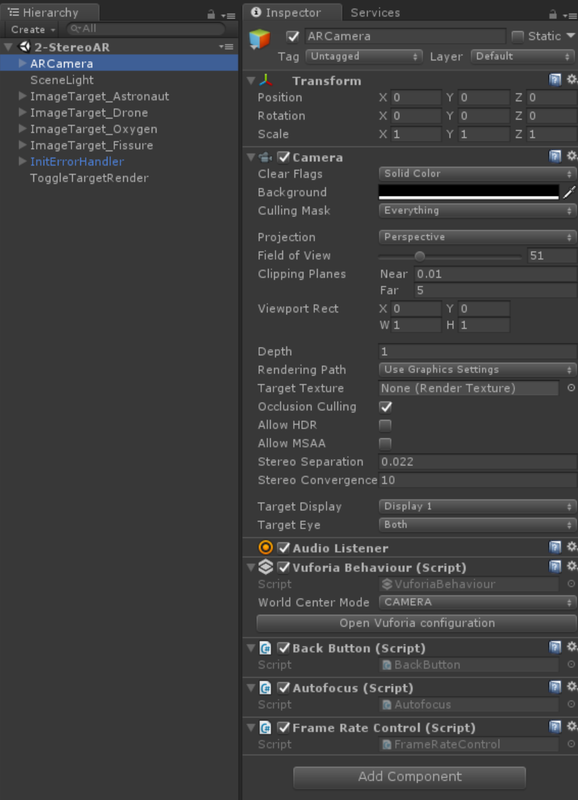 The issue is that when I look at an image target, it would spawn the model but when I look away and then look at the target again, the model does not appear. I then enabled Extended Tracking. When I deploy this build the model loads and stays fixed at the target model, however, the build will not recognise a different target (that has the same image). 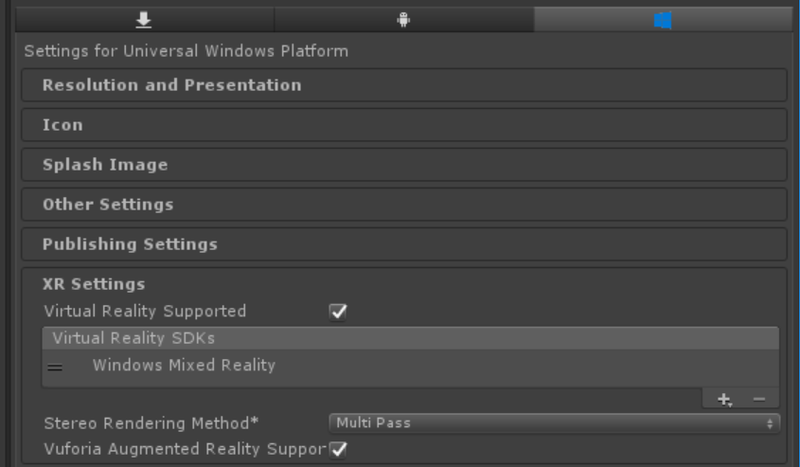 I do have have Windows Mixed Reality and Vuforia SDKs in my XR settings. I am using Unity 2017.3.0p4, and using the Vuforia package that comes built in the engine. Is there a log somewhere, or have I missed something? Also is it possible to use the Holographic Emulation that let's stream the build to the hololens? This value has changed to "Digital Eyewear" in Vuforia 7. Please use this instead of "Optical See-Through"
I'm trying to configure my Digital Eyewear section but for the "Eyewear Type", there is no option for "Optical See-Through". I only have Handheld, Digital Eyewear, and Phone + Viewer as options. How do I get the optical see through option to appear? I downloaded the Vuforia Stereo asset from the asset store. I am using the Core Samples Image Target scene, Thanks! Im facing a problem with my vuforia app in hololens which is the images tracking isnt working well. i did my app using unity 2017.2.0f3. 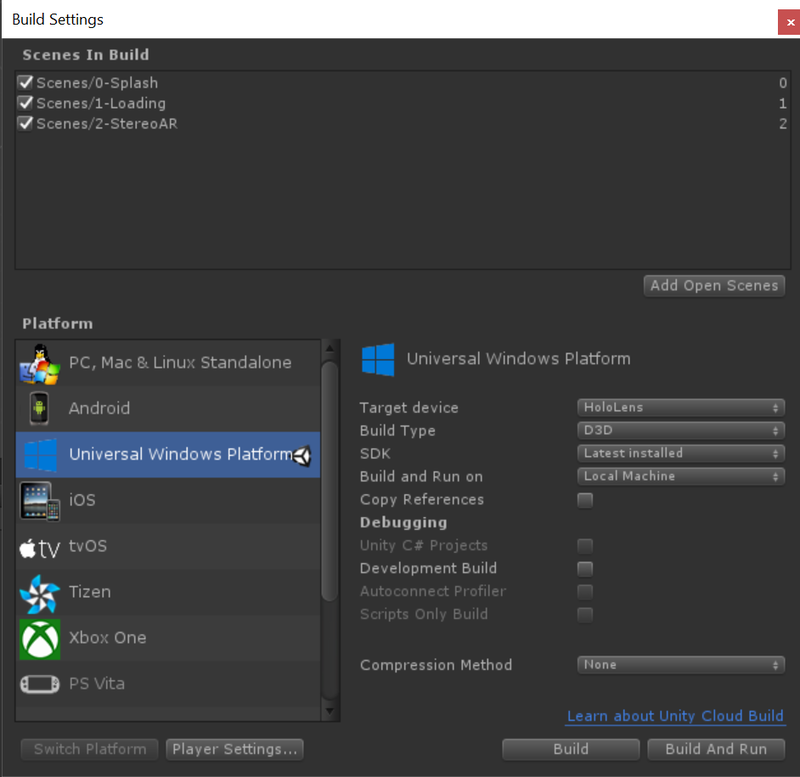 Now, http://https://assetstore.unity.com/packages/templates/packs/vuforia-stereo-rendering-for-digital-eyewear-101471 only support unity 2017.3. so, should i upgrade my unity and try this app? and will it work fine in the hololens? If in my application i don't need Vuforia in first scene, but i need in the second scene, Have i to use ARcamera also in the first scene? Unhandled exception at 0x5F99ADEA (UnityPlayer.dll) in Sample.exe: 0xC0000005: Access violation reading location 0x00000004. I am using Unity 2017.2.0f3 and Visual Studio 2017. I followed the instructions posted here, but I'm not sure what I'm doing wrong. Please let me know what other information might help. Even doing the step by step quoted I am not able to install in apk in hololens. Error DEP 6720: Failed to deploy 'Standard Colletor Brige' package. That doesn't look like an issue related to Vuforia. A quick Google search on the error message shows that you might require a repair on your Visual Studio installation. according to your ARCamera for Hololens Sample.png, there is no HoloLens Camera in the hierarchy. Does it mean that there is no longer need to bind holoLens camera to ARCamera of Vuforia? This is correct, you no longer need to bind the ARCamera to the HoloLens camera. WIndows 10 (Fall Creators Update )is the Fall Creators Update mandatory please suggest. Visual Studio 2017 Community Edition Which comes along Unity 2017.2. I don't believe the Fall Creators Update is required, just Unity 2017.2 and 2017 VS.
Are you using the Stereo Rendering sample or the Core Samples Image Target scene? Failed to get spatial stage statics - can't retrieve or interact with boundaries! Error code: '0x80040154'. Unloading 10 unused Assets to reduce memory usage. Loaded Objects now: 648. Operation took 9.397400 ms.
System memory in use: 17.2 MB. Could you help me to figure out what are the issues might be for occurring the failure. Thank you!!! Hi ,Sir Thanks for the steps ,another doubt i have is does the hololens setup rewuire the HoloToolKit Cursors,HoloCamera and HololensManger Objects???? Or does the above mentioned steps are enought to deploy to Hololens and interact?? Please suggest.